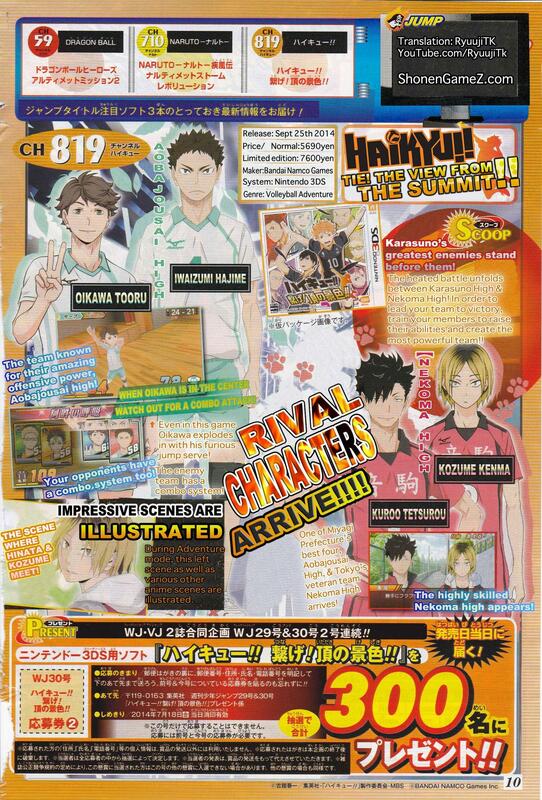 Aobajousai High, the boy’s volleyball team who is ranked in the top 4 of the Miyagi prefecture and Karusano’s greatest enemy, Nekoma High will be making an appearance in Haikyu!! Tie! The View From The Summit, that latest issue of Jump confirms. Aobajousai and Nekoma are two teams Karusano faced during the beginning of the series. You must level up your characters in order to lead your team ti victory against these fearful teams. Additionally, during Adventure Mode, there will illustrations shown from different scenes of the Anime. Haikyu!! Tie! The View From The Summit!! will be released on September 25th for the Nintendo 3DS in Japan. A limited edition is announced as well which includes a Can case, DVD and Poster Cards. Read More: Haikyu!! Tie! The View From The Summit!! The definition of shonenGamez. = Asap Anime/manga News !!! – #ImlovinIt! !